BCCT in collaboration with AMCHAM, AustCham and GTCC invites you to join the evening briefing on Data Protection Laws. The Europe Union (“EU”) enacted new data protection laws that came into force in May of last year and now Thailand appears to be on the brink of enacting data protection laws of its own. 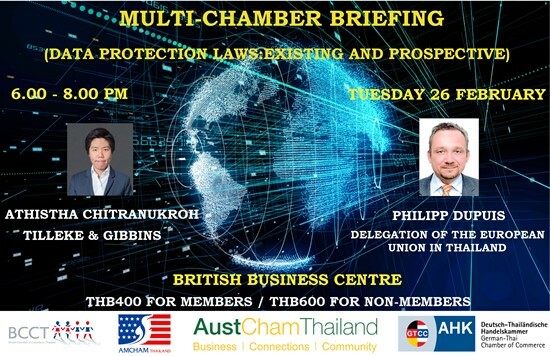 On the evening of 26 February at the British Chamber of Commerce in Thailand at British Business Centre, BCCT Office, 7th Floor, 208 Wireless Road, two distinguished speakers will address these developments. Philipp Dupuis of the Economic and Trade Section of the Delegation of the European Union in Thailand will speak on how the EU’s new laws affect business in Thailand, and Ms. Athistha Chitranukroh of Tillike & Gibbins will speak on Thailand’s draft Data Protection law. Cost: THB 400 net per person for member of BCCT and participating chambers & THB 600 for non-members. Price includes finger food, soft drinks, beer and wine. Payment at the door.